Forse tutto quello che si può dire sulla guerra lo si può dedurre da una foto. Un bimbo guarda sua madre piangere al funerale di suo padre. 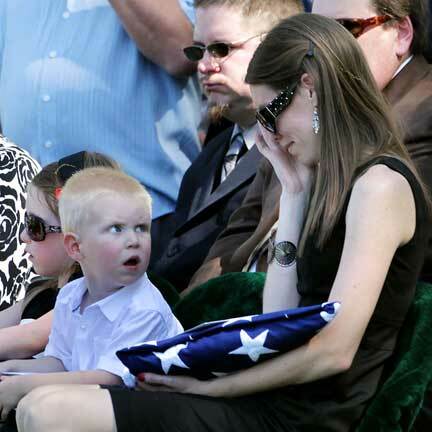 Aimee Myers’s son, Kaiden, looked at his mother during his father’s burial at Arlington, Va., National Cemetery Monday. U.S. Air Force Tech Sgt. Phillip Myers was killed April 4 by an improvised explosive device in Afghanistan. The return of his body was the first covered by the media since the Pentagon lifted its 18-year ban.